Vote forHervey Bay, QLDTop Regional Destinations Which are Australia's must-visit destinations? You help us decide. Known as the unofficial 'Whale Watching Capital of Australia', Hervey Bay on the central Queensland coast is a laid-back, sunny seaside destination that provides all the relaxation, coastal beauty, and aquatic-focused benefits of some of the country's bigger-name destinations - without all the excess crowds. Featuring some truly spectacular stretches of coastline teeming with marine life and a relaxed atmosphere, Hervey Bay is an ideal getaway destination for those who love the combination of water, sunshine and peace and quiet on their holidays. There's plenty of opportunity to get out on the water for some fun here – while whale watching is an obvious calling card due to the large number of these gentle giants which pass through during their annual migration each year, there's far more to Hervey Bay than this. Divers will love Hervey Bay for its range of extremely accessible dive sites and snorkelling opportunities, while those who prefer their fun above water can take part in the likes of scenic cruises, waterskiing, kayaking, surfing and swimming. This charming coastal nature also comes with plenty of greenery to explore inland, some dashes of history mixed in, and an overall wide range of things to see and do for lovers of the Great Outdoors. Hervey Bay isn't merely a destination limited to kicking back and putting your feet up in front of the ocean, however; if the simple act of relaxing isn't your thing and a dose of adrenaline is in order, Hervey Bay is also one of Australia's most popular skydiving destinations due to its perennially clear skies and amazing scenery which can be viewed during the freefall from thousands of feet above. Those looking for exploration opportunities also have the incredible duo of both Lady Elliot Island and Fraser Island within easily accessible reach, and trips to both from Hervey Bay are a more than viable way to extend your holiday here. The city itself is no slouch, either, boasting an excellent esplanade area where visitors can soak in views of the coast while taking a stroll and visiting shops, enjoying a beer or indulging the tastebuds with a bite to eat as the glow of the sunset adds its own layer of charm to the proceedings. There are plenty of great restaurants in the region owing to both the talents of their chefs and the incorporation of fresh produce that ranges from seafood to nuts to excellent wine. Those looking to keep the family entertained will find plenty of things to do to keep the little ones occupied as well – get up close with marine life at Reef World Aquarium, try your hand at some high-speed thrills at the Hervey Bay Go Kart Track, cool off with some splashtacular fun at the excellent WetSide Water Education Park, or simply enjoy nature with a picnic in the wonderful Hinterland. Whether you're out to explore and take part in the various seaside or island activities or simply after a relaxing destination that tends to be far less crowded from other, larger counterparts, Hervey Bay and its surrounds provide a peaceful yet stunning environment in which to escape from urban life. Looking to pay a visit to Hervey Bay but not sure what to do? Here are some of the most essential experiences. Need more info on Hervey Bay? Check out our detailed travel features on this top spot below. Hervey Bay's beautiful weather and diversity of experiences combine to make for a flexible destination where it's possible to do as much - or as little - as you like. We highlight 10 essential things to do here. Not just a destination for adults, the Hervey Bay region's appeal to families is obvious. As a result, it's just as well there's enough to keep those travelling with kids well entertained - we take a look here. 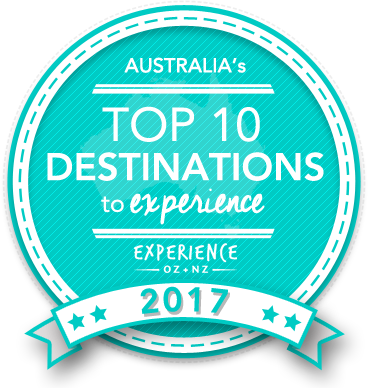 Is Hervey Bay Australia's Top Regional Destination to Experience for 2017? Vote now for the chance to WIN an epic trip to one of Australia's top destinations!